Winter is here, and that means flu season is upon us. Not to be too melodramatic, but anyone who has experienced a severe flu or cold knows that prevention is key. For myself, I rely heavily on the immune-enhancing power of the elderberry to get me through the winter. 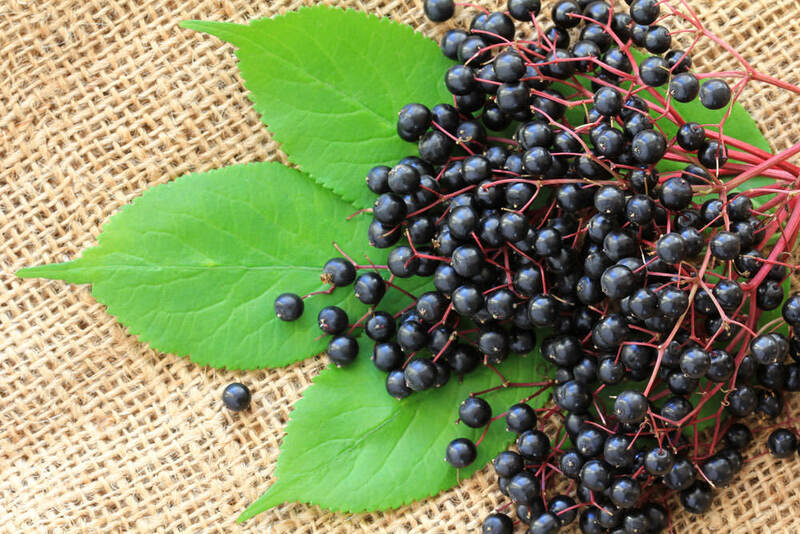 If you’re not familiar with elderberries, you’re not alone! You won’t find elderberries cozied up next to the blueberries, raspberries, and strawberries in your local grocery store. These wild berries have a tart taste that lends them more to jellies, syrups and honey infusions. But there is much more to berries than their sweet taste, and this is definitely the case with the elderberry which just happens to be a great natural flu remedy. As is true for most wild foods, elderberries have been studied for a wide range of health benefits. In my opinion they stand out most strongly for their viral and bacterial protection which makes them a great natural flu remedy. When I feel a cough, cold, or flu coming on, I start dosing myself with elderberry like it’s going out of style. I have kids at home, so for good measure I make sure I get some form of elderberry in regularly during the winter to stave off those viruses they love bringing home from school. Elderberries are rich in flavonoids which give them their antioxidant component and lovely blue color. Apart from its immune enhancing qualities, elderberry has also been studied for lowering cholesterol, heart health, and improving vision. Your best bet for elderberries is to either forage them yourself or pick up some dried berries at your local herbal shop. They are also available for order online if you don’t have a local herbal shop. If you are foraging them yourself be aware that there are two types of elderberry, the blue and the red. The red is toxic to your health and should not be consumed, so go for the blue! My favorite way to get elderberry in my diet is by making a syrup from honey and elderberry. Honey is also immune building so they pair quite well. This syrup can be used on pancakes, to sweeten your tea, as part of a marinade or dressing, or straight up like cough syrup…except much more yummy. If you feel a cold coming on take up to 1 tablespoon an hour. Here is a recipe I use to make my syrup, it will last up to two months in the refrigerator. Enjoy! Simmer 2 ounces of dried elderberries in 1 quart of water over low heat until the liquid reduces to half the original volume (1 pint). This makes a strong elderberry infusion. Strain the herbs using a cheesecloth or fine strainer, and return the liquid to the pot on low heat. Add 1 cup of honey to 1 pint of infusion and stir on low heat until the honey melts. The longer you allow it to simmer, the thicker the syrup will be. Once at desired thickness, let cool and pour into a glass container for storage.